We splurge on filet mignon a few times a year, it’s the most expensive cut of steak because it’s incredibly tender and you can only get about 9 filets per cow. 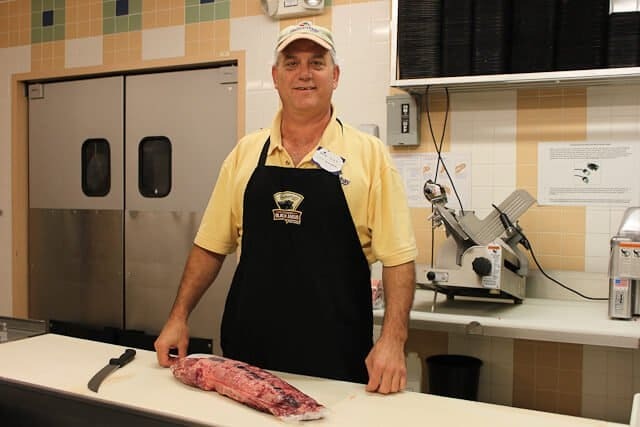 Instead of buying the filet mignon piece by piece, we always get the entire tenderloin and spend the time to carve it up ourselves for a 50% price savings. 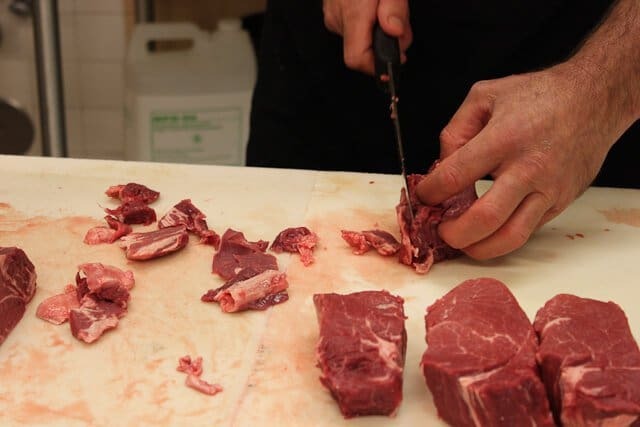 Trimming tenderloin is actually a lot easier than you think. In fact, it’s easier than any other steak cut, mainly because the size is manageable (have you seen a how massive the rib roast is!?) and the meat is so tender you barely have to put any strength into carving. By the way, if you’re not into carving this up yourself, just ask the butcher at Sweetbay to do it for you, free of charge. 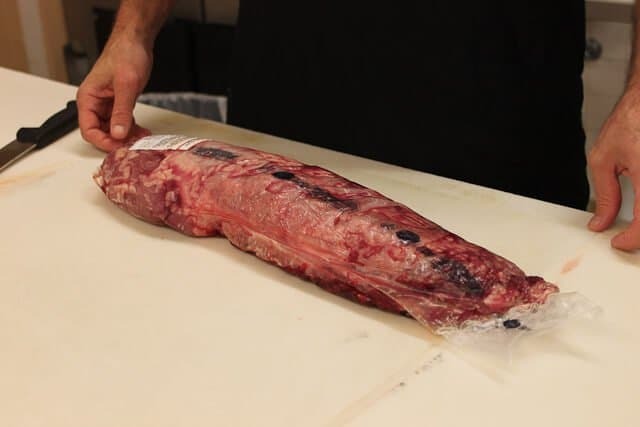 This is a whole tenderloin. It comes wrapped and sealed to keep its shape and freshness. Don’t open the package until you’re ready to carve. If you’re carving this up yourself, take note that there’s quite a bit of blood inside the bag. What I like to do is to open just one end of the bag and let the blood drain into the sink first before taking the tenderloin out. There’s a small end and a large end. We’ll start cutting from the bigger end. 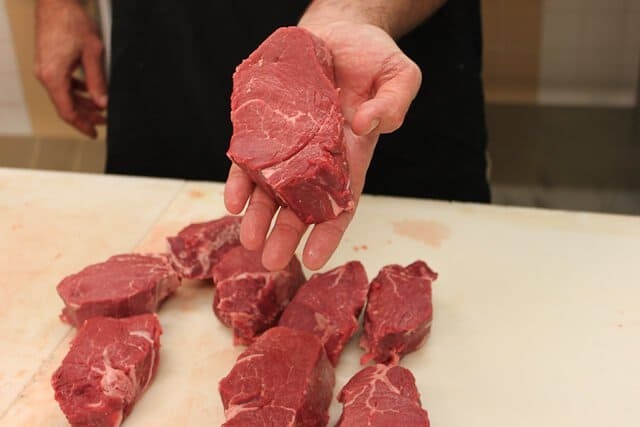 When you get down to the smaller end, you can make smaller filet mignon pieces and use twine to tie 2 of them together to make a bigger piece. When it gets too small, Pat will grind the remainder with the scraps for filet mignon ground beef. Another option is to use the smaller pieces for a stir fry or stroganoff. 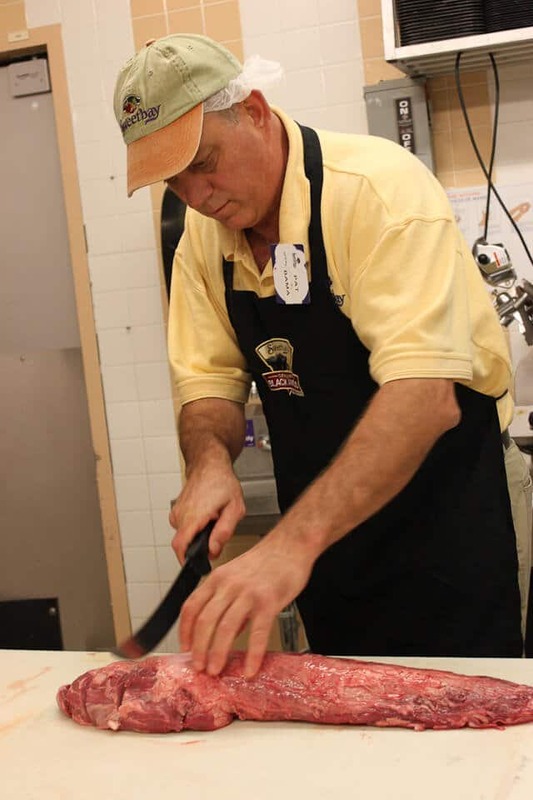 Pat begins cutting 1¾” thick slices from the larger end. You can cut yours smaller if you wish. Here’s a cut for you to look at. Notice there’s fat around the filet, that’s okay, Pat will trim that off later. 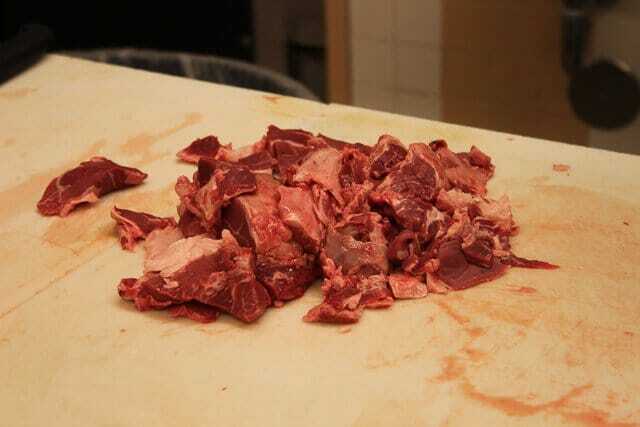 This was my biggest lesson – I used to trim the fat and the silver skin off the tenderloin FIRST, which made a massive mess and wasted too much good meat. Once all the pieces have been cut, Pat trims each one carefully, taking off majority of the fat and the thick, tough silver skin. Look how perfect this is. And the size! You get massive cuts. 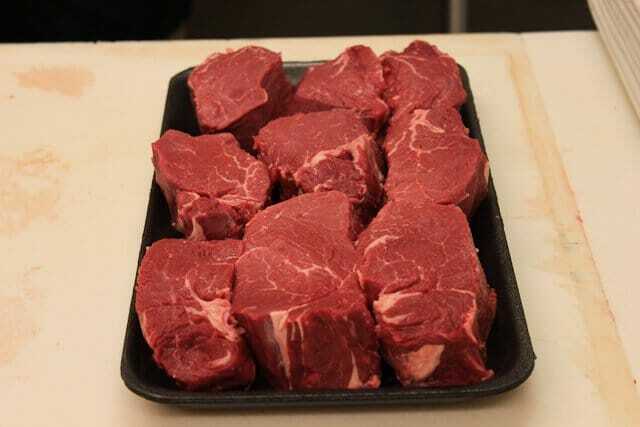 We got nine 1¾” large filet mignon from the tenderloin. The leftover scraps – including the fat – will go into the grinder. Again, if you prefer to use these as-is, cut them into smaller pieces and use them in stir fries! Into the grinder it goes and now I’ve got 4 pounds of the very best filet mignon ground beef. Use this ground beef for any dish that you want – though meatballs and burgers don’t work very well. 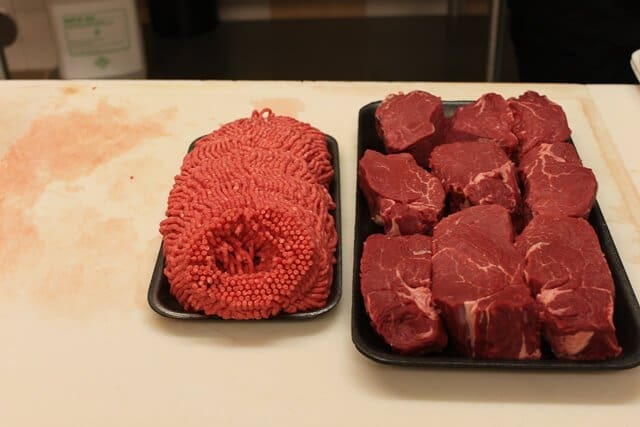 The filet mignon ground beef is so lean that it will have trouble binding together. I see some Asian Lettuce Cups with Ground Beef in my future! I’ve just saved nearly 50% and will have a freezer full of filet mignon (I’ll seal each filet mignon individually). 2. Heat a saucepan with the butter, balsamic vinegar over medium heat. When the balsamic begins to bubble, turn the heat down to medium-low and cook for 3 minutes to reduce to half. Add in the red wine and the beef broth and let simmer for 5-8 minutes until reduces to a sauce thick enough to coat back of spoon. Taste and season with salt. 3. Place the peppercorns in a baking sheet. Use a heavy bottomed skillet to gently crush the peppercorns by pressing the bottom of the skillet on top of the peppercorns using a rocking motion. 4. Rub each filet mignon lightly with the cooking oil. 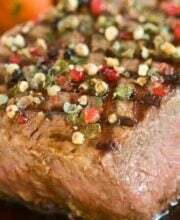 Season each filet mignon with salt on both sides and then press the filet mignon onto the peppercorns on both sides. 5. Heat large oven-proof skilling on high heat. When very hot, add the filet mignon, searing both sides for 1 minute each. Remove the filet mignon from the heat and onto the baking sheet (it’s okay if there’s still peppercorn on the baking sheet). Place into oven for 4-7 minutes, depending on your desired doneness and thickness of filet mignon. For 1-inch filet mignon: 4 minutes and then check temperature with meat thermometer. For every ¼” more, add 1 minute. 6. 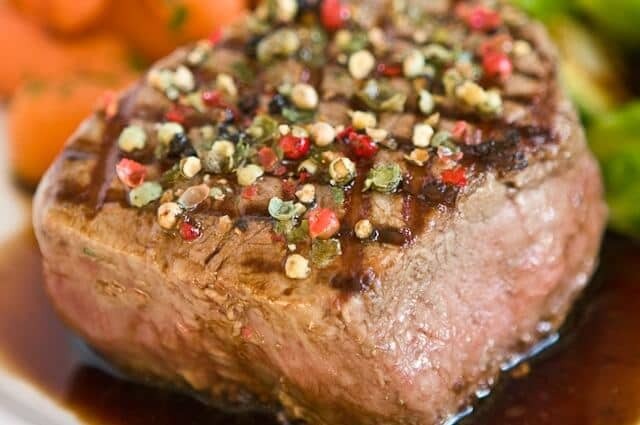 Let rest for 3 minutes before serving with the Balsamic Sauce.